Here in Chicago, we are seeing a new trend: families are purchasing 2 flat apartment buildings in Andersonville, not for rental income, but as a multi-unit family home. As a resident of Andersonville since 1988, I am amazed at the high buyer interest from couples and their out of town parents. Is this a result of family members living all over the county and needing quarters for extended visits? Is it that real estate hasn’t been this affordable in 49 years? Is the shortage of single family homes in popular neighborhoods like Andersonville, Edgewater, and Lincoln Square that is shifting buyers to 2 flats? In this case, families seem to be strongly attracted to the versatility of 2 unit buildings. Often, the impending arrival of a first or second child motivates couples to purchase the buildings, with plans to occupy the first floor apartment and convert the basement to adjacent living space. The second floor apartment is reserved for out of town family members to visit, and as the children get older or as siblings come along, the family may use the entire building as primary living quarters, converting the second floor to a master suite, complete with a large master bath in place of the 2nd floor kitchen. 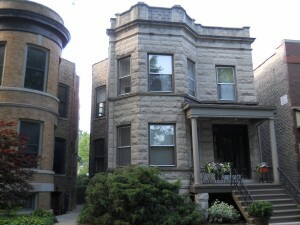 Initially, 2 unit apartment buildings are great starter homes, and down the road they can become large single-family homes, which are in short supply in neighborhoods like Andersonville. Families also see a second unit as a potential hedge against economic hardship, since they have the ability to rent out the second-floor apartment for income to help cover expenses like utilities and property taxes. For two perfect examples of Andersonville’s versatile 2 unit apartment buildings, take a look at 5449 Ashland and 1418 W. Balmoral. The Ashland building has jumbo 6 and 7 room apartments and an extra bath in the basement. Balmoral is a lovely greystone that lends itself well to conversion to a single family home, and has a beautiful back yard. Both buildings had multiple offers, and sold within a few weeks of listing. With upsides for both practicality and budget, it’s clear that the popularity of Andersonville’s 2-flat trend won’t be won’t be fading anytime soon!